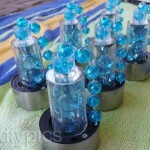 Here in an easy and inexpensive solar powered chandelier you can make for your next garden or beach party. This poor bicycle rim has gone through several incarnations–first as a wind-powered water pump, then as a floating garden, then a baby float, and finally this solar chandelier (oh the things you can make with free bicycle parts!). I think this is my favorite incarnation, and will be even better when I swap out the beads for bicycle chains to give it a more industrial look. 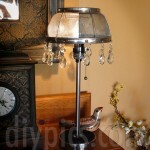 Anyway, I hope the pictures below will help you make your own solar chandelier. 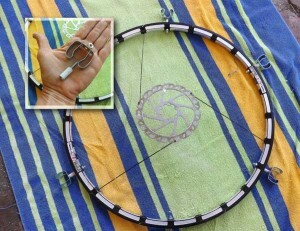 It is important to know that not all bicycle wheel rims are the same. 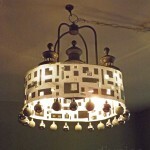 The one I used for my hanger chandelier has 32 spokes, but the one I used for this chandelier has 24. Another thing to know is that bicycle brake pads have 15 holes evenly spaced around the edge. In this solar chandelier I used three bicycle spokes to hang the wheel rim from the brake pad, and that worked because 24 and 15 are both multiples of three. However, if you’re using a bike rim with 32 holes, then you should use a bicycle gear for the inner part of the chandelier, then use four spokes instead of three and drill four holes evenly spaced in the gear to hang the wheel rim from. Screw six broom hooks into a bicycle rim using 1 1/2 inch screws and 1/2 inch spacers as shown above. Place them evenly around the bicycle rim. If you are using a bicycle rim with 32 holes, then you’ll need 8 hooks instead of 6 because you can’t divide 32 evenly into six or seven. I used solar lights purchased at a Dollar Store for this chandelier and embellished them with other Dollar Store finds. 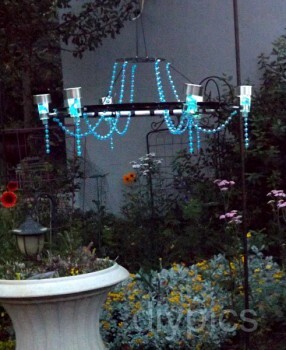 To make the light colored instead of plain white, I poured a few blue glass stones inside the solar light container, then added a string of blue beads below the solar lights. 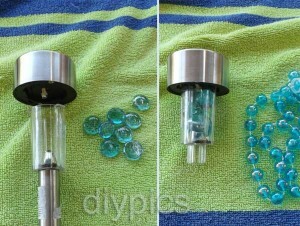 To add a string of beads, pull the stake off the bottom of the solar light, pour glue inside the hole below the light, and insert beads. Let dry. If you’re using bicycle chains instead of beads, you will have to drill small holes in the plastic light and tie the chain to the light with fine wire. Drape strings of beads from each solar light to the bicycle brake pad or gear using fine crafter’s wire. 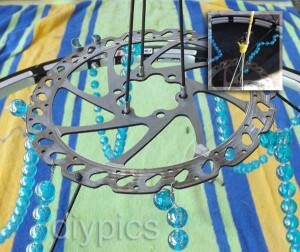 To hang the chandelier you will need to insert three more bicycle spokes through three holes in the brake pad or bike gear (that is, holes that you drilled in the gear). Insert the threaded side down and screw a nut into the bottom end of the spokes. Join all three spokes at the top and tie with wire or nylon string, then use this wire or string to hang the chandelier from a hook or tree branch. 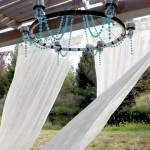 You now have a beautiful solar garden chandelier that will cast a warm summer glow on your next soiree! You can experiment with different beads or bike chains, more lights, three tiers instead of two, etc, to make your solar chandelier unique. Please share this tutorial with friends if you thought it was helpful.